1. Sponge Daubers – everything looks better with a little ink on the edges. It gives depth and texture to the project. I have one dauber for each color, I use small labels to label which color it is used with and I store them in separated draws according to color collection. After a while of use, the sponge gets tattered and it’s time to replace it. 2. Sanding Block – The Sanding Block works great when your cutting blade is getting little dull and you are left with tiny balls of fiber on the edge of your paper. I just flip my paper over and sand off those tiny fibers. I also use mine to rough up the edges of cardstock and dsp when I want a more distressed look. 3. Bone Folder – I love clean, crisp edges and my bone folder helps me get a good creased edge every time! 4. Mat Pack & Paper Piercer – The Mat Pack is so versatile, It can be used to create a straight row of stitching holes, or to create perfectly aligned brads. I use mine to make a hole in the center of flowers to place brads. It’s a must have on my table. 5. Ruler – I like to be precise when it comes to measurements. When you make several of the same card, it helps to be aware of what size paper you are cutting for different aspects of your project. I think of how many I plan on making of this project and how many of each piece I can get out of a piece of paper. It makes it really helpful when cutting for the rest of the cards after you’ve finished the first “proto type”. The sneak peek project I have for you today is below. 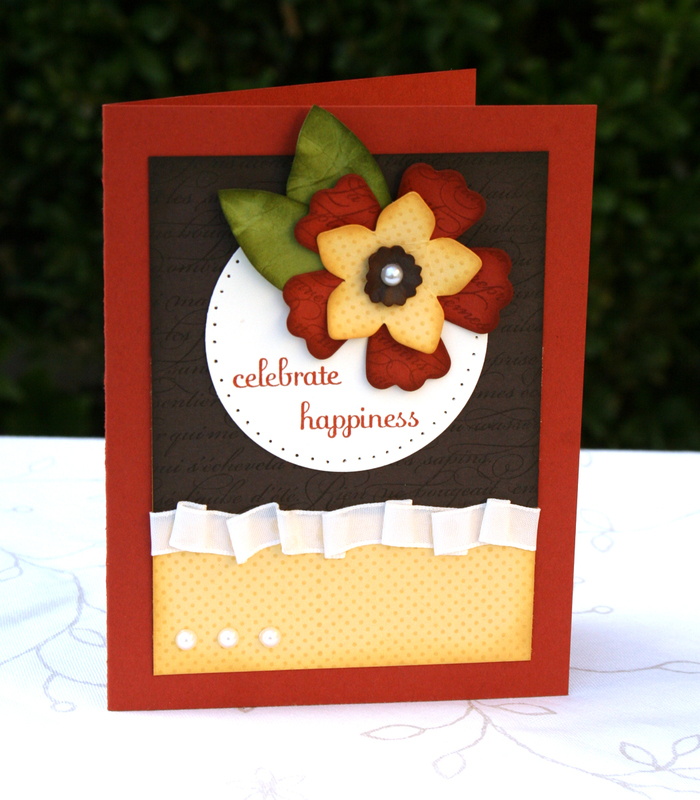 This card uses a new Die for the Big Shot Die Cutting Machine, it is called Fun Flowers. The large Cajun Craze flower and the Early Espresso flower center was cut using the Fun Flowers Die. This flower is the smallest of 3 flowers on the die. Each flower can be used alone or layered for a fun dimensional look. I got some fabric quarters so I could make some fun fabric flowers to wear on my apron or attach to bags. I’ll share those when I finish them. If you have already received your copy of the Occasions Mini, you can see the Fun Flowers Die on page 39. This is fabulous – colors and shading are poppin! How did you do the dark center, it doesn’t look like it’s from either Big Shot set?